If you’re interested in Asian and Islamic Art then have a look at the website of Alexander Merchant Art Ltd. It displays their permanent collection, which specialises in Mughal and Indian metalwork. A reminder that the complete Koran is available for online viewing in the Library’s LUNA collection. A full Book Reader object can be found here. Enjoy! Dr Alison Ota, the director of the Royal Asiatic Society, visited the John Rylands Library today to inspect our giant Koran manuscript. 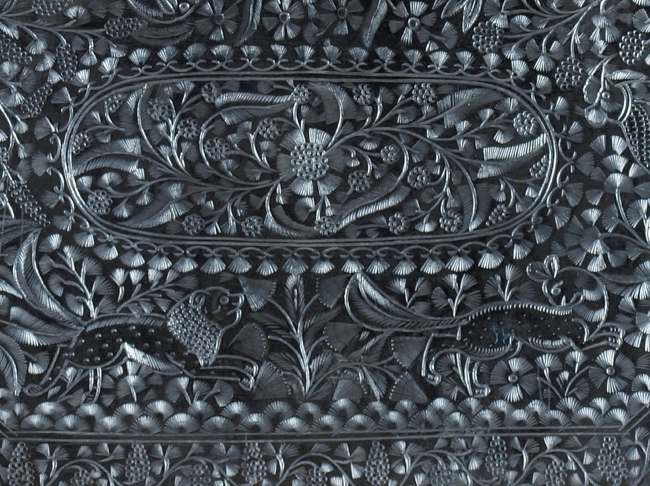 Dr Ota is an expert in Mamluk bindings, and her curiosity was sparked by our digitised images. 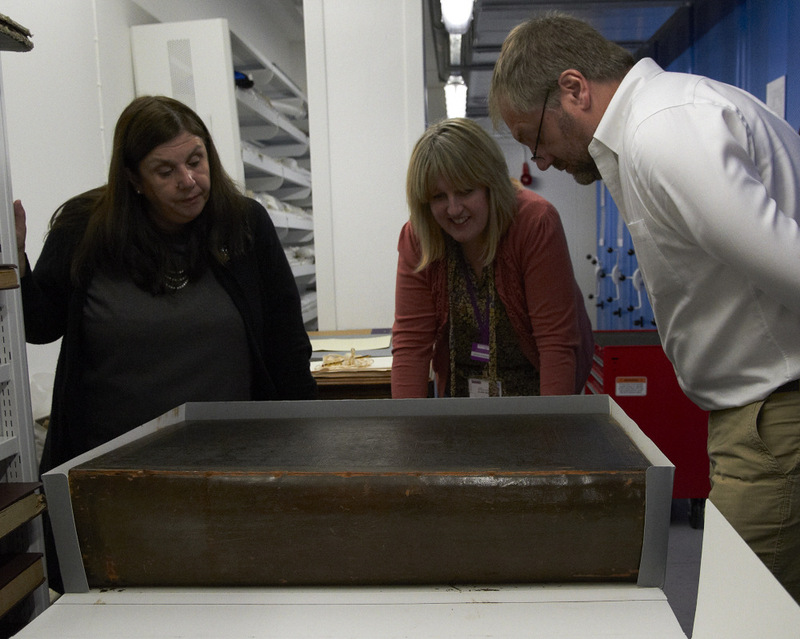 She was joined by John Mumford, Head of Manuscript Conservation at the National Library of Egypt. After inspecting the binding and viewing the digitised pages in highest resolution, Dr Ota was able to confirm that both manuscript and binding are from the Mamluk period, probably produced between 1357and 1379. This is much earlier than the previous dating – Mingana’s catalogue gives it as early 16th century, dated from the seal of the library of Sultan Kansuh al-Ghuri. She confirmed that the manuscript has been rebound in its original boards, which constitute a very rare and fine example of Mamluk binding and tooling. 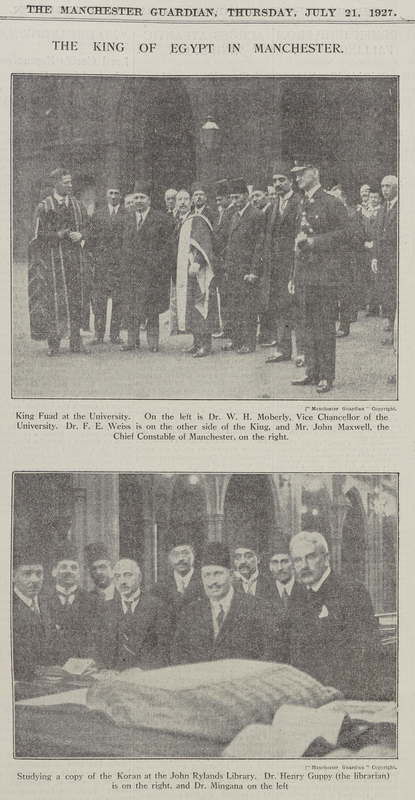 By amazing co-incidence we showed Dr Ota a newspaper article detailing the visit from the King of Egypt to see the manuscript in 1927 and realised that it happened exactly 85 years ago today. 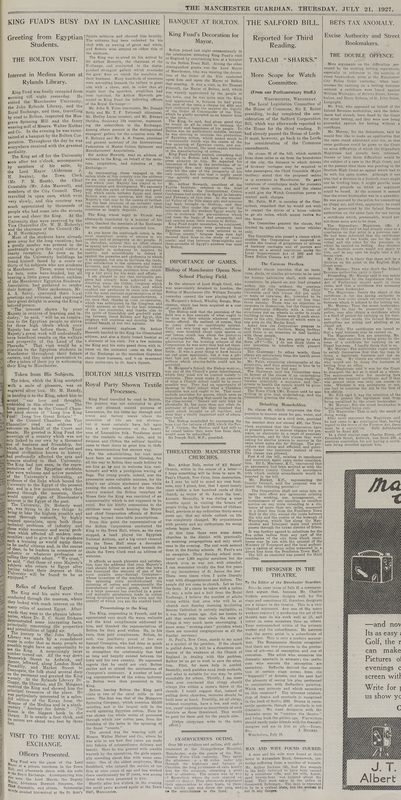 The story was reported in the Manchester Guardian on 21st July 1927. It’s the second Egyptian co-incidence in 24 hours. By chance, John Mumford arrived in Manchester last night and so visited the opening of Faces and Voices, our new exhibition. He hadn’t realised that the exhibition features mummy masks from Fayum, a region that a few years ago John had introduced to our Collection Care Manager, Caroline Checkley-Scott. The Rylands links with Egypt deepen…. On Monday the 6th of June, Faculty Team Librarian and Senior Photograher James Robinson will be part of a very interesting conference here in Manchester.’3D: Digitise, Deliver, Discover‘ is being hosted by the University Of Manchester in the Manchester Conference centre. Unlike most events of this kind which tend to be highly specialised, 3D will be wide-ranging and aimed at a broader target audience, to include academics and students, technical experts and digital novices with an interest in digitisation. 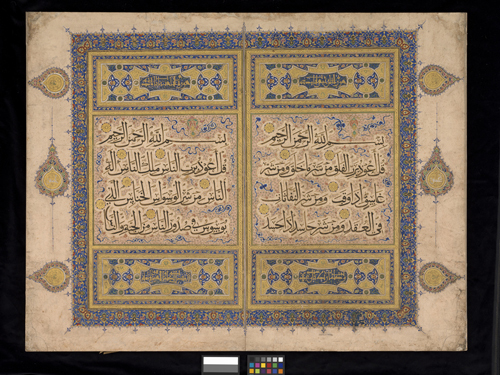 Paul and James will give a presentation about the Koran digitisation project, covering all aspects from the history and importance of the Koran itself, to the virtual copy in Turning The Pages, and press coverage. 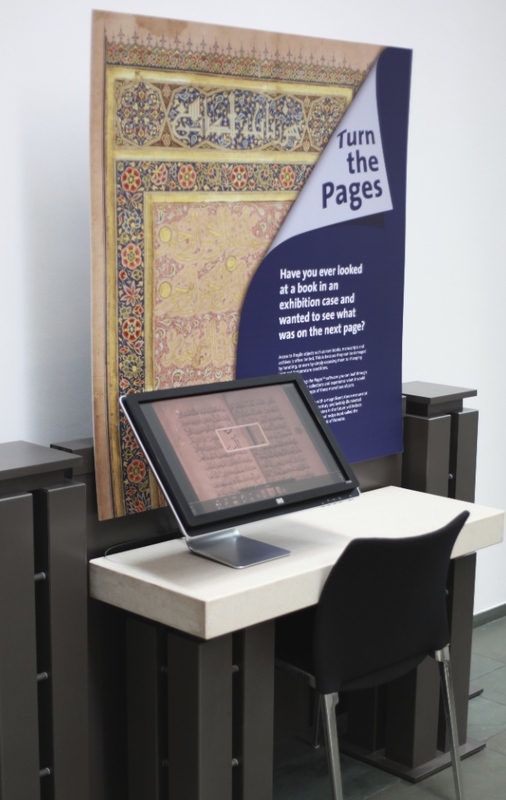 The test section of the Koran is now installed onto the touch screen station in the library (John Rylands Library Deansgate). It is situated at the top of the stairs in the new atrium. We want your feedback! Comments cards are being drafted up now, along with a brief description of the software and how to use it, and also the history of the Koran itself. Other virtual books are being prepared now too. If you have any suggestions of what you would like to see, get in touch! The pages held over at the Chester Beatty Library are now with us and we are working to put them into the right order with our images. As the leaves were mounted together, we have had to cut them (in photoshop of course!) to fit into the virtual version of the manuscript. It may take us a little longer to get these extra images inserted into the the correct place, but the Turning the Pages kiosk, with a test version of the Koran should be available in the Library this week. We are very excited to see the software in action, and will be looking for feedback. So come in and give it a go!